Serves two. 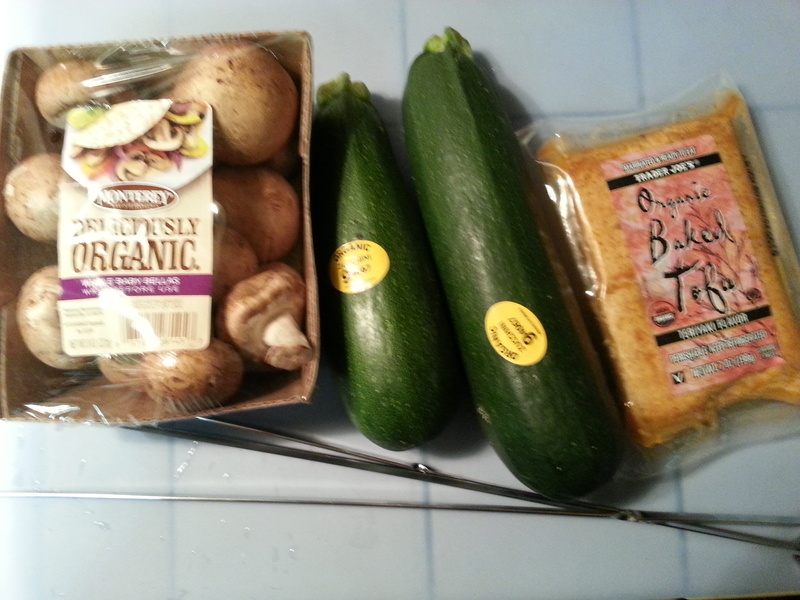 All ingredients are organic. 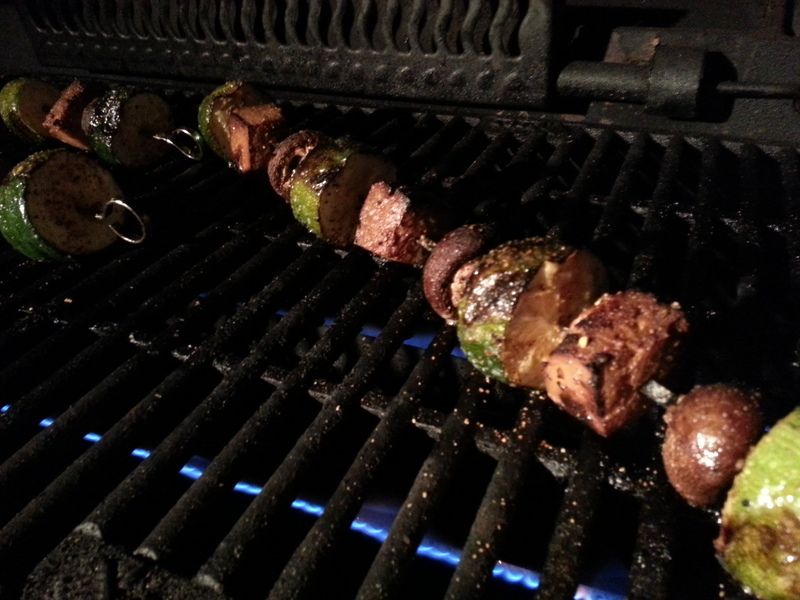 Note: Tofu tends to stick, so make sure it’s properly oiled before putting it on the grill. 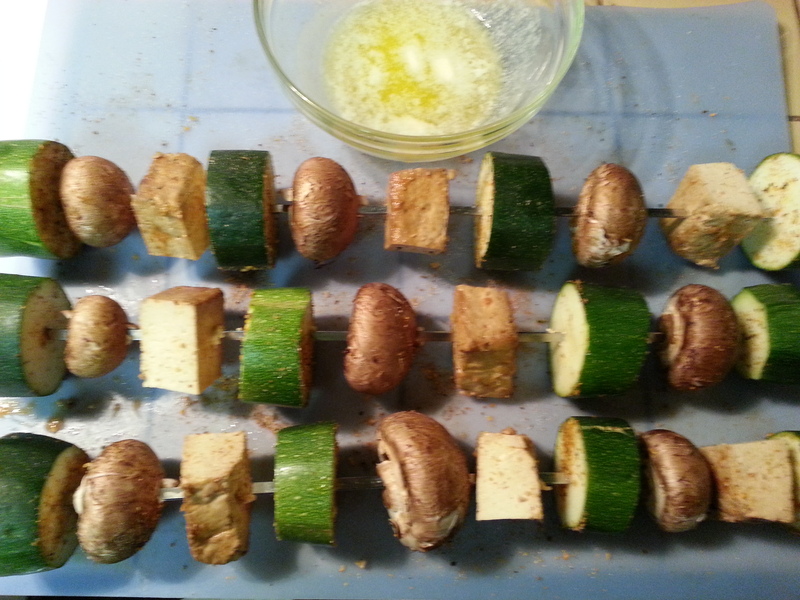 Wash the zucchini, and slice into 3/4 inch thick rounds. 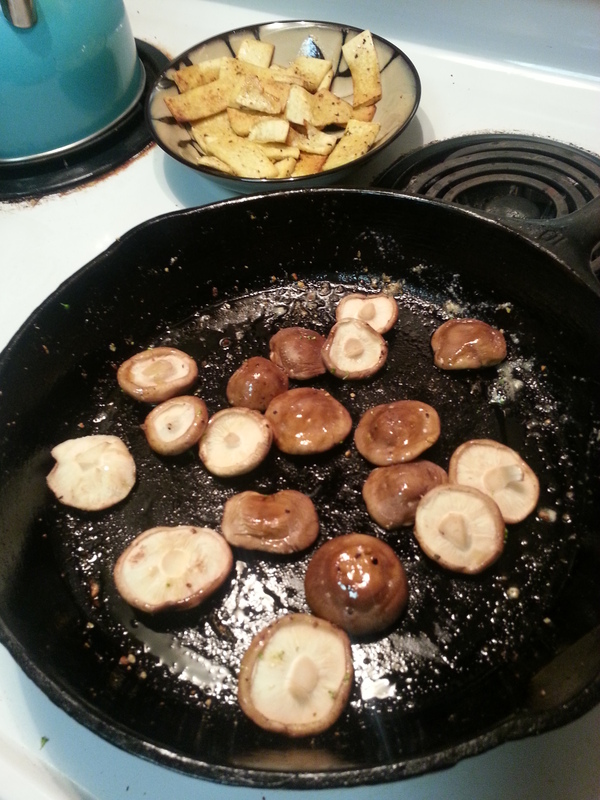 Wipe the mushroom caps with a damp cloth to get the dirt off, cut the stems off. 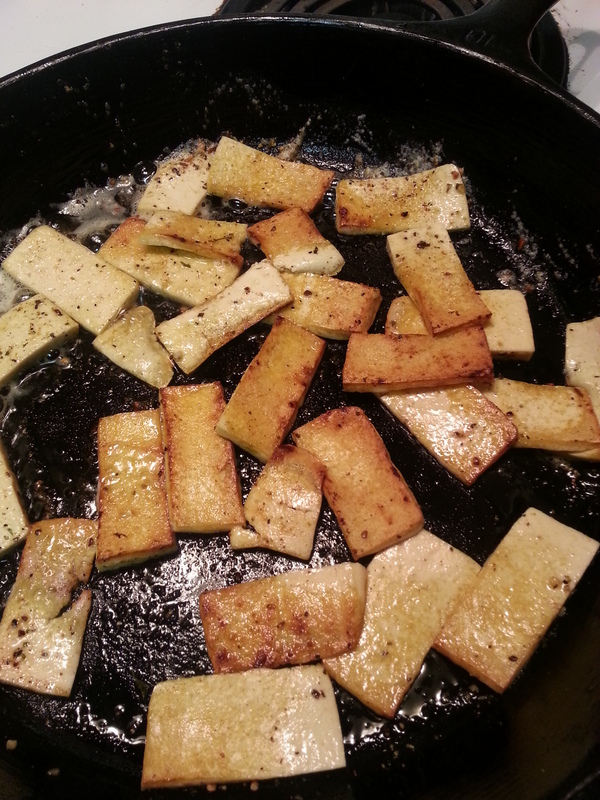 Open up the tofu and cut into about 1 inch chunks (I got 8 chucnks out of mine). 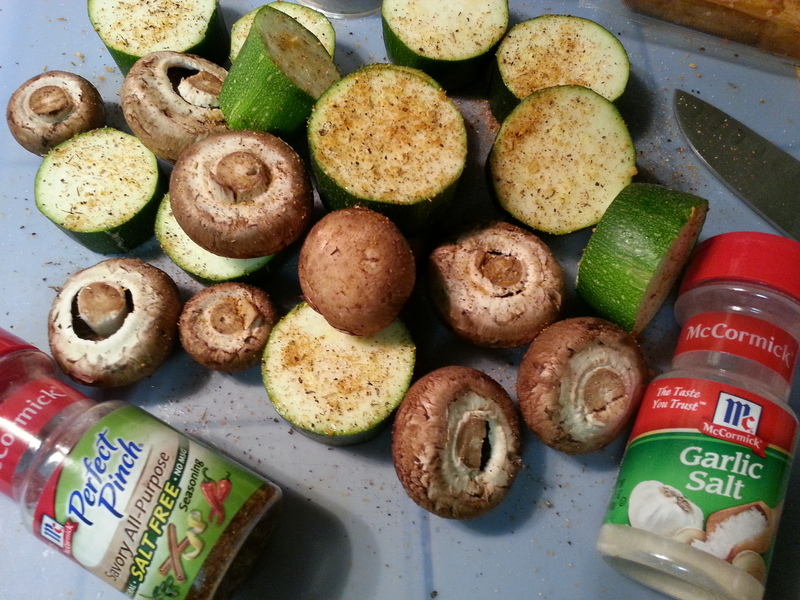 Sprinkle mushrooms and zucchini with salt, pepper, and your favorite grilling spices. 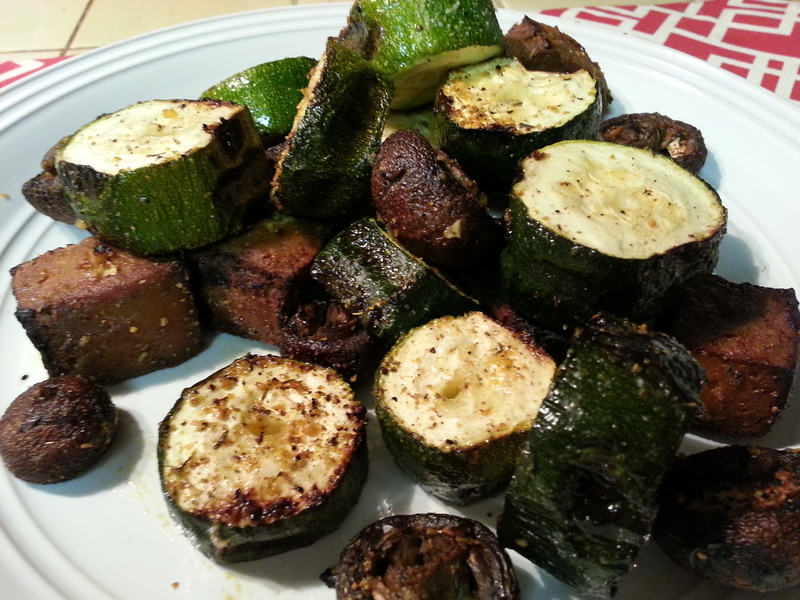 I used pepper, garlic salt, and McCormick’s “Savory” blend. Skewer your items in whatever order you choose. 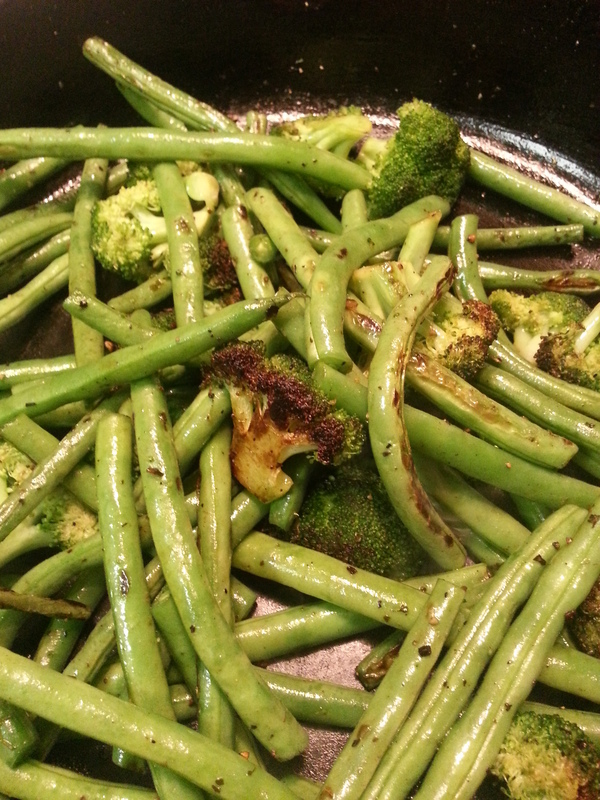 I melted a couple tablespoons of butter mixed with a couple tablespoons of olive oil to brush on my veggies so they don’t stick to the grill grates. You can use whatever you want to keep it from sticking. I turned my grill all the way to low beause it runs hot, but probably somewhere between low to medium will be perfect for cooking these. Remove after about 15 minutes and serve! They are tasty on their own, or you can dip them in teriyaki sauce. Enjoy! 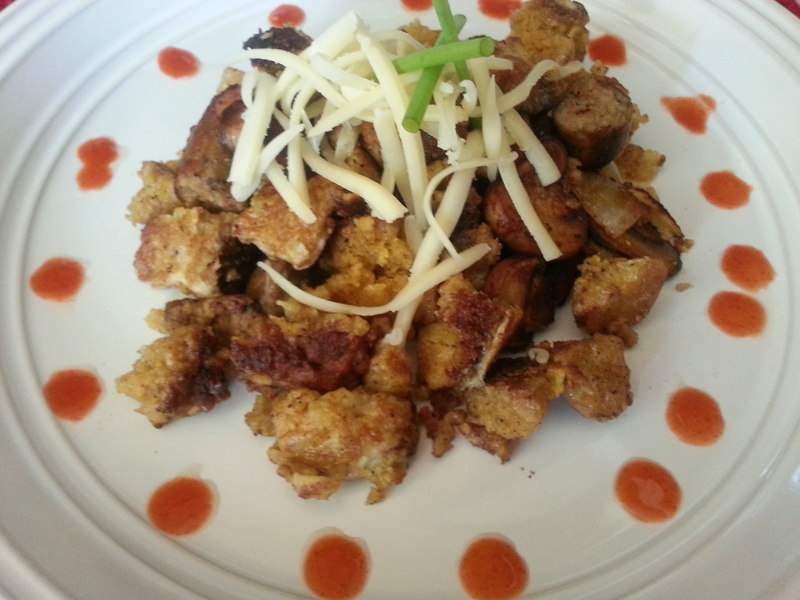 I hate a boring breakfast … that’s why I’ve created tasty-wacky creations such as my Cornbread Breakfast Skillet. This next recipe is one of my favorite go-to breakfasts. It can be changed up to be taco-style with salsa, cheddar cheese, and sour cream on top. 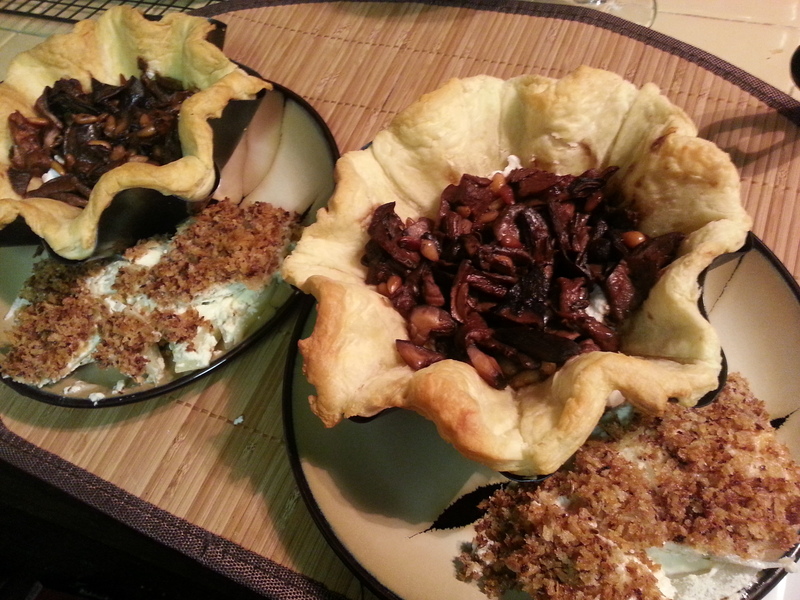 Or it can be dressed up as gourmet with goat cheese and pine nuts. 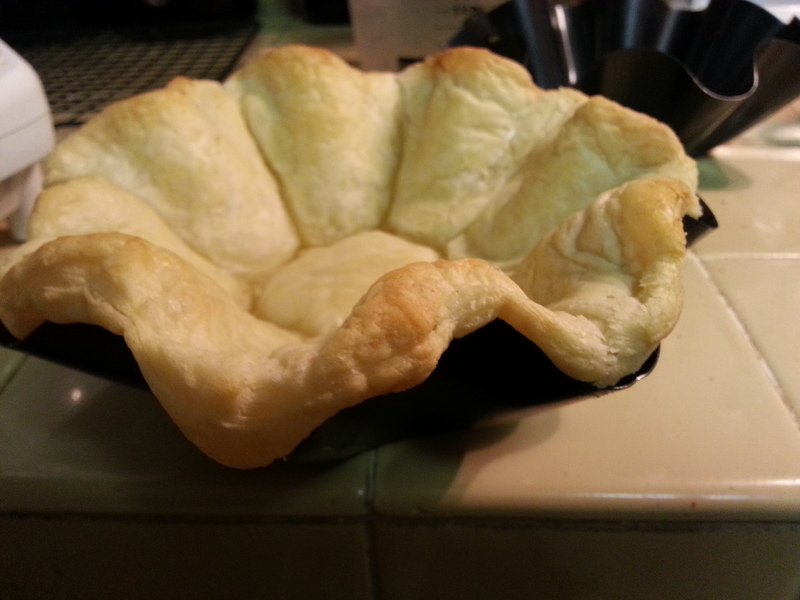 Here’s one of my basic recipes. 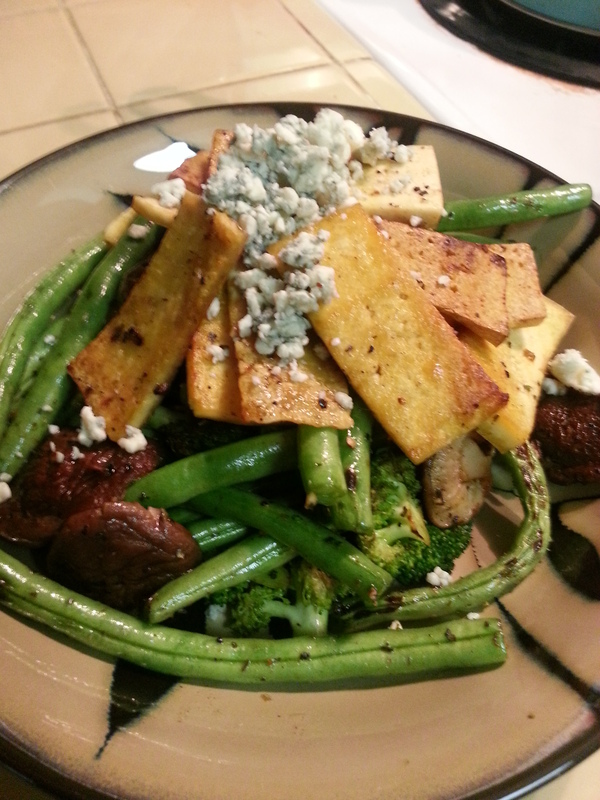 I threw in the artichoke hearts in because I needed to use them up. Feel free to add or subtract any of the ingredients to fit your family’s taste. Meanwhile, bring a pot of salted water to a boil. 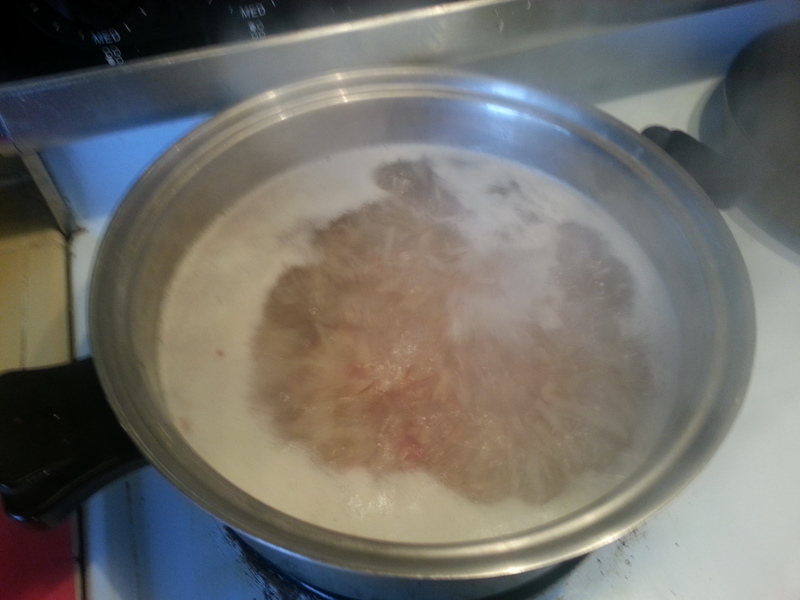 Add shredded potatoes, boil for 1-2 minutes, drain into fine mesh sieve or colander. 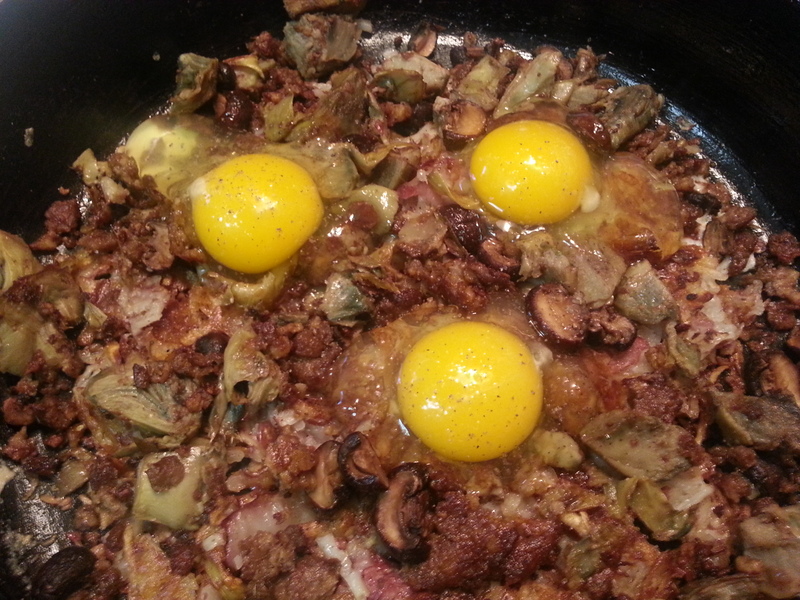 In a large cast iron skillet heated to medium, add sausage, mushrooms and artichoke hearts. Fry until slightly brown and crispy. 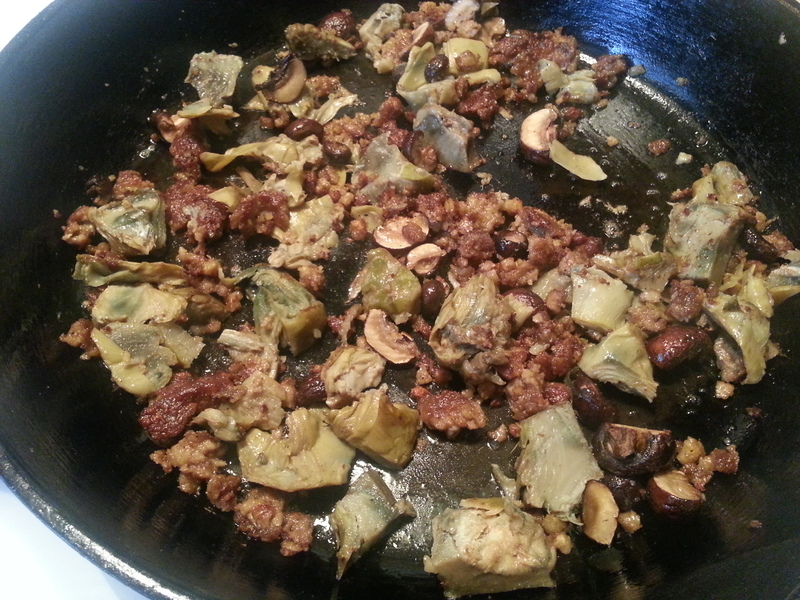 Remove from skillet and set aside for later. Get the skillet hot again. Add oil or butter of your choosing. Then add the shredded potatoes. Fry until brown and crispy on both sides, about 6-8 minutes on each side. Add more oil/butter as needed to keep frying the potatoes up nicely. 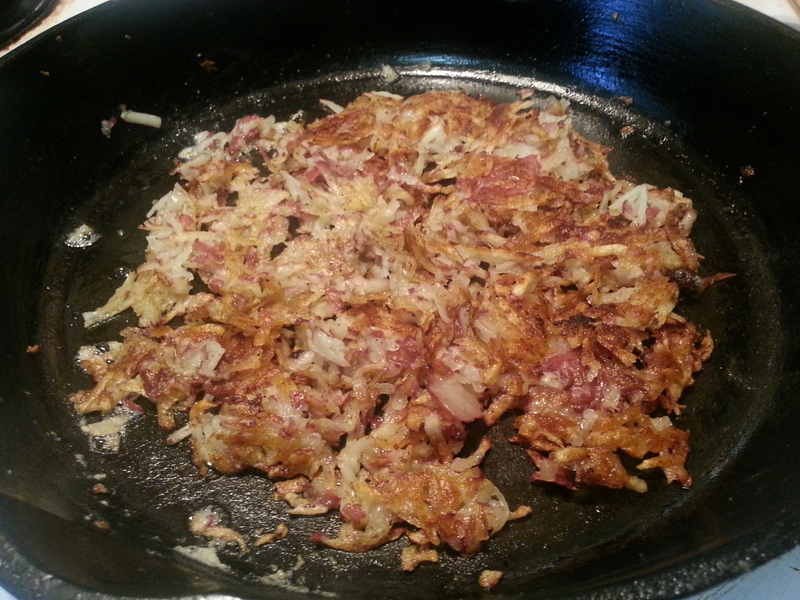 *Note* The trick to great crispy hash brown is not moving them around too much. If you move them around … the starch in them gets all gooey and that’s what gives you chewy potatoes. The blanching process we started out with helps rid the potatoes shreds of some of their starch so they will fry up nicely. Next, layer the sausage, mushroom, artichoke mixture on top of the hash brown layer. Crack the eggs over the top. Season with salt and pepper. 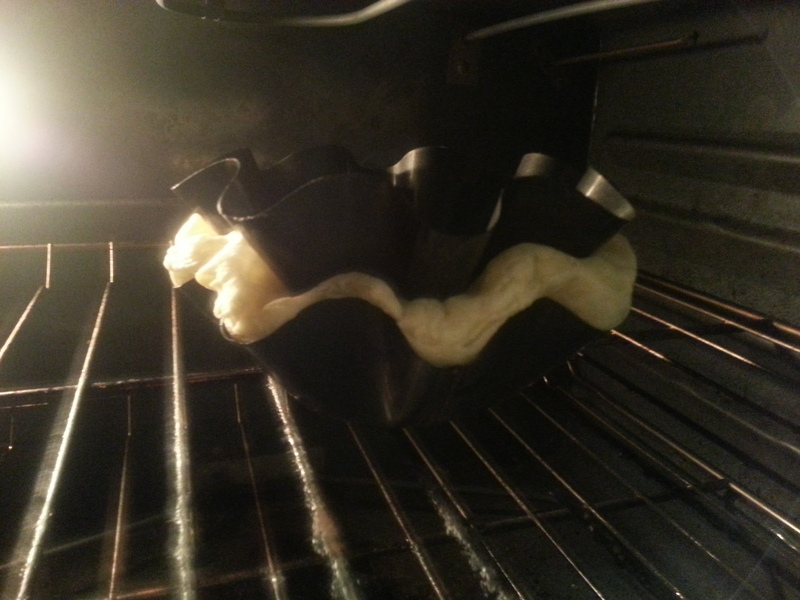 Bake in the oven for 15-20 minutes. Or until the eggs are cooked to your liking. I like mine well-done. 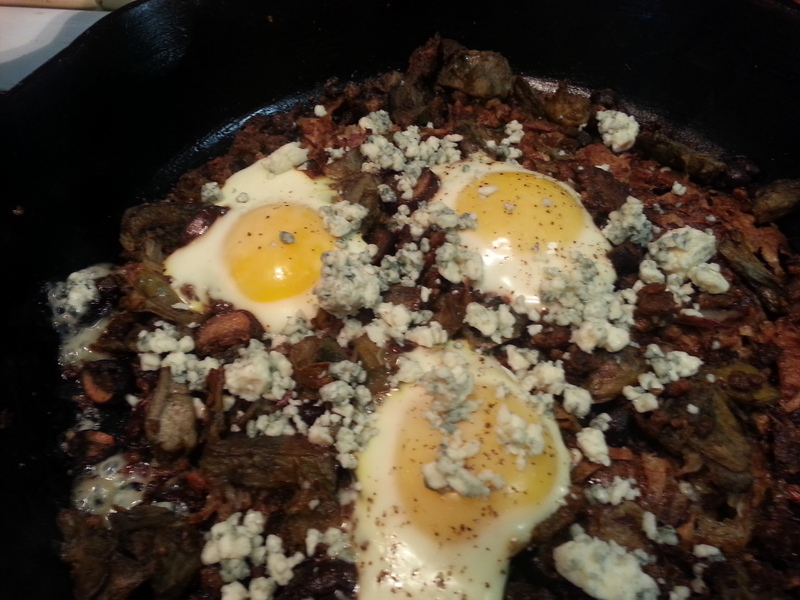 Top the skillet with a sprinkle of blue cheese and serve it up! How do you overcome the boring-breakfast blues? Cornbread for breakfast? Yes! I just said that. I have an on-again/off-again relationship with eggs, and I want a healthy meal that’s not the same old boring breakfast items you can find anywhere.This is what my silly brain came up with this morning while I was drifting somewhere between sleep and consciousness. 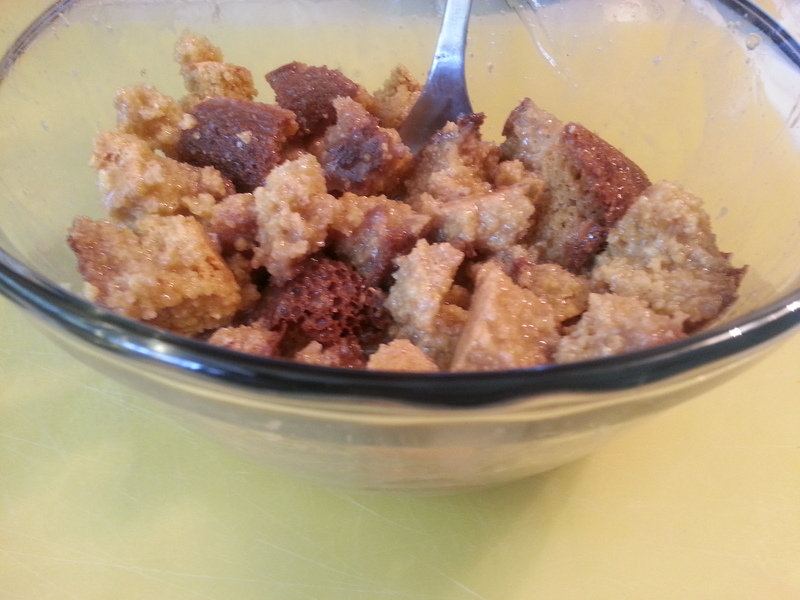 I will note I was under a bit of stress as to what to do with the large amount of leftover cornbread from last night’s vegan chili extravaganza – which explains my wierd dreams of cornbread for breakfast today. 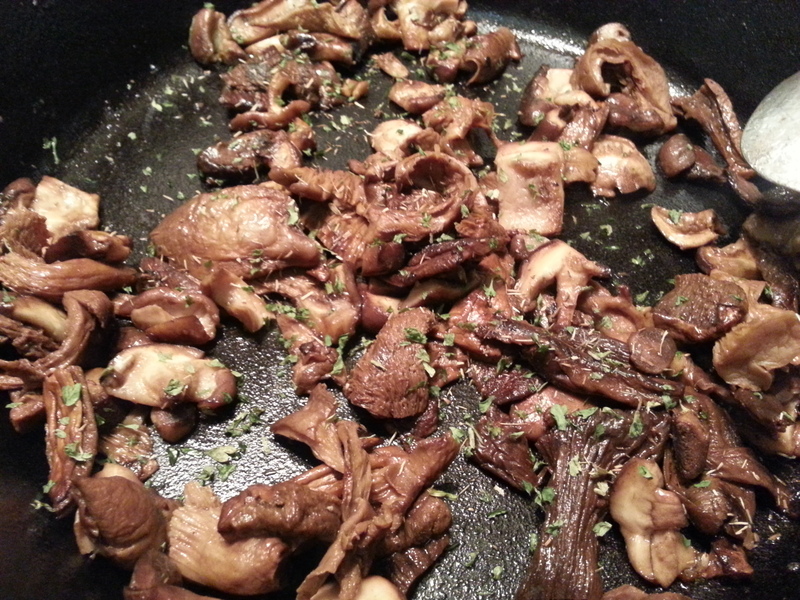 In a skillet on medium, add some oil or butter. Then add the sausage, mushrooms, and onions to the pan. Season with salt and pepper. 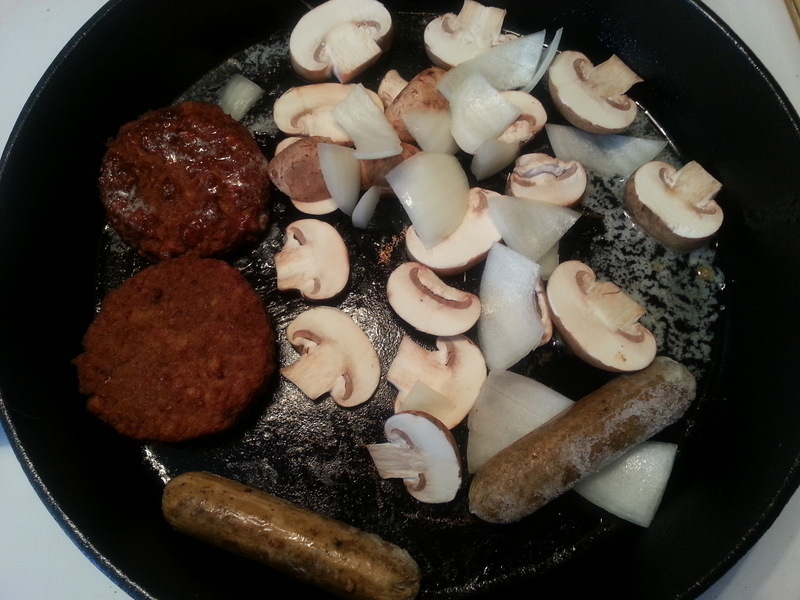 As you can see, I had two morning star sausage patties, and two links … I just used a mixture. 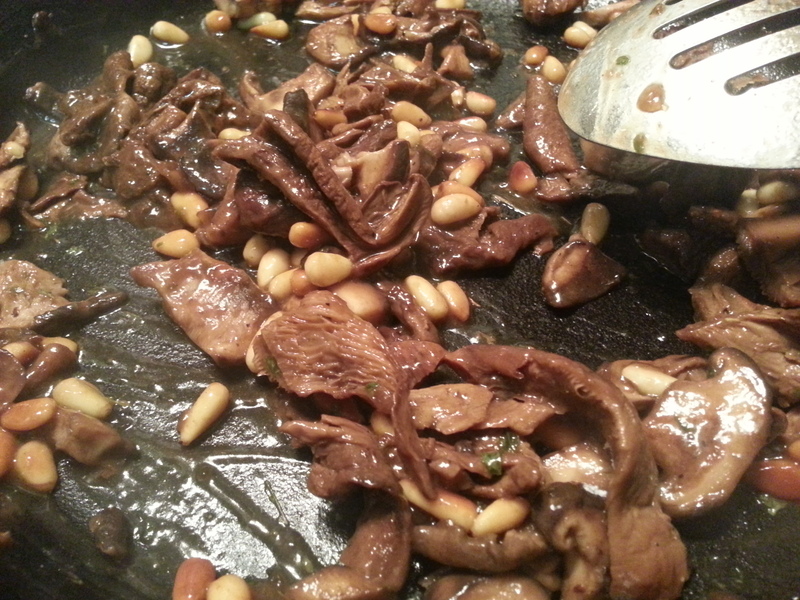 Once everything is nice and brown and yummy, remove from the pan and set aside to be added back in later. (I chopped up the sausage into bite-sized chucks). 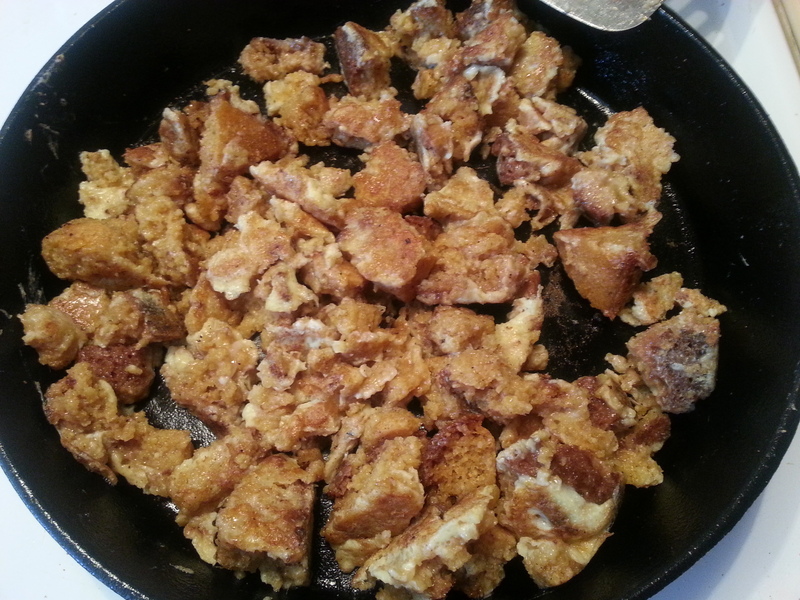 Now be sure to add a pat of butter or some more oil to your pan before you put your egg-cornbread mixture in there. Add the mixture, and fry up over medium to medium low heat. You want the eggs to cook, not burn. 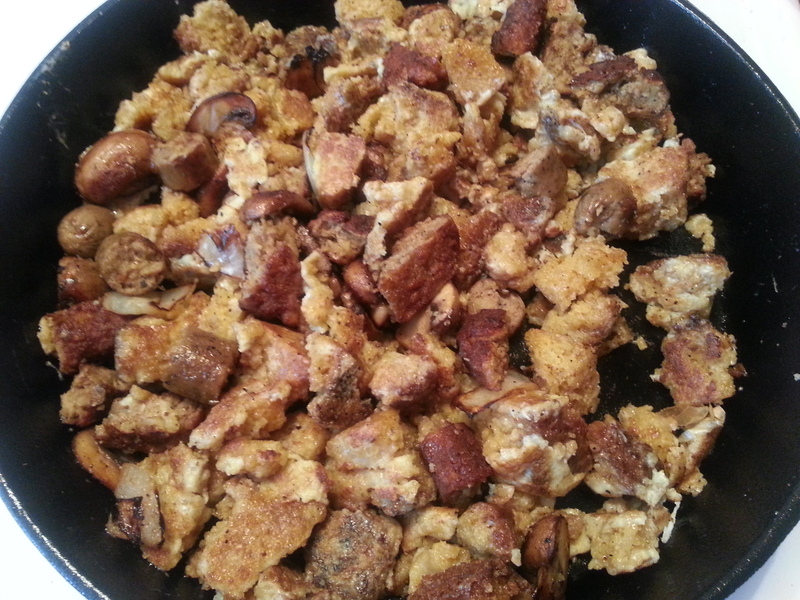 Once the eggs look cooked, and the cornbread is a bit toasted looking, add the mushrooms, sausage, and onions back in. Mix to combine and warm through. I plated mine by topping it with grated cheese, some green onion, and added some hot sauce to the side. 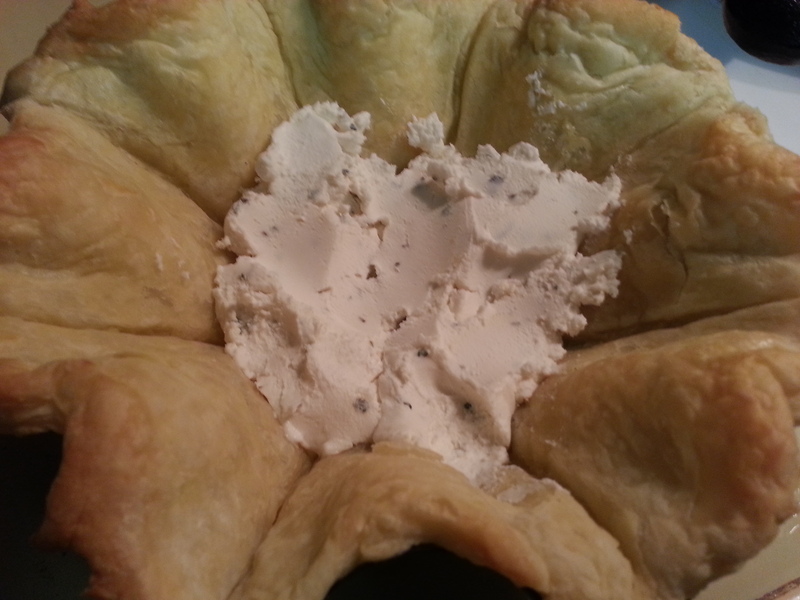 It was savory, satisfying, and filling! This is definitely not a boring breakfast. How do you spice up your breakfast? Please tell me in the comments.